Yesterday was the feast of Pentecost, final day of the season of resurrection, of Eastertide, as we tend to call it at Kern Road, and observance of the descent of the Holy Spirit on the apostles and other followers of Jesus. “Pentecost, 50 days after Easter Sunday, celebrates the coming of the Holy Spirit and the birth of the church. As the Holy Spirit fell on the disciples, the barriers of language and culture were broken down, not so that everyone thought and looked the same, but so that everyone understood each other in their own language and culture. This festival draws us beyond the resurrection to remind us that through the coming of the Holy Spirit we become part of a transnational community from every nation, culture, and social class,” Christine Sine wrote some years ago in a Pentecost post at Mustard Seed Associates’ Godspace website. Pentecost celebrations have been more about fire than wind in previous congregations in my past, so it was a somewhat stretching experience to focus during Kern Road’s 2016 Pentecost service on the atmosphere as a part of the creation for which we are charged with caring, as we also considered how God’s breath was loosened to blow across the face of the earth on that first Pentecost. In connection with these categories, retreat participants asked themselves how they experienced the gift of breath and where in life they needed to breathe more deeply; where in life they felt asleep and where they sensed the need to be awakened; how they might lean into the Source that supports and buoys them; how they might embrace the gifts hidden in suffering rather than banishing the suffering; and when they had experienced the current of the Spirit lifting them. wind” by blowing bubbles, walking in the wind, watching birds take flight, noticing trees and flowers blowing in the breeze, considering the power of a windmill, listening to wind chimes, using art supplies to draw representations of the wind, writing poetry or Haiku about the wind. 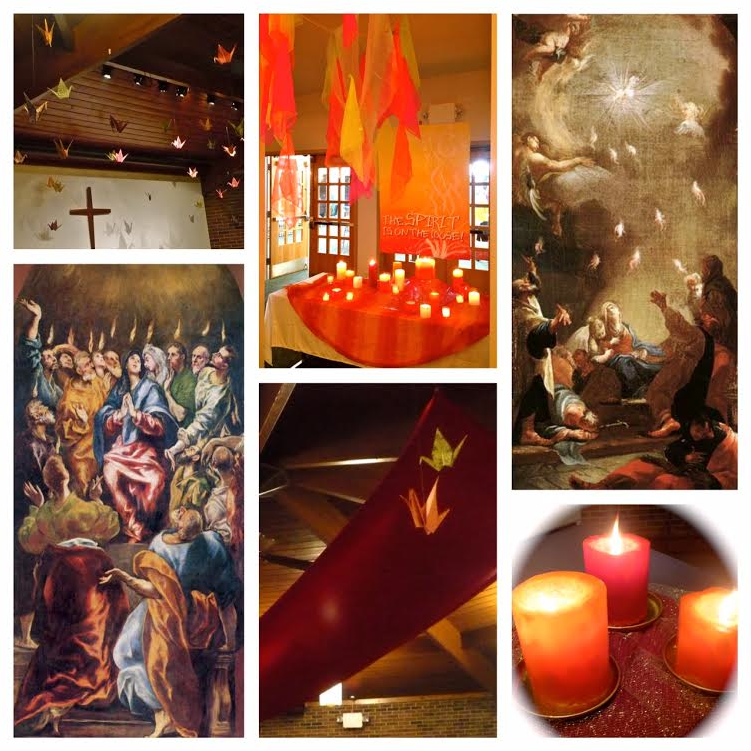 Memories of that retreat, co-mingled with representations of Pentecost’s tongues of fire which always have had a powerful influence on me at this time of year, remind me again that the wind and fire of the Spirit are available to us, though certainly not at our beck and call. Where have we seen Divine wind and fire at work in our lives or the lives of others?